I try to recreate the outer Earth visual on the engine, and I'm at a good point. bnut unfortunately I don't know how to recreate the rim effect of the atmosphere. I searching a lot on the net about a tutorial or something, but unfortunately i didn't find anything about how to replicate this effect, I even send a message at the guy of the video to ask him how he achieve this effect, but he didin't answer. So i'm asking if anyone of you can teach me how to get this, or if you have some tutorials to follow. I use a FogVolume to create the atmosphere. With the right tweaking it can be made to look good enough. I can attach the FogVolume element to a sphere for example ? 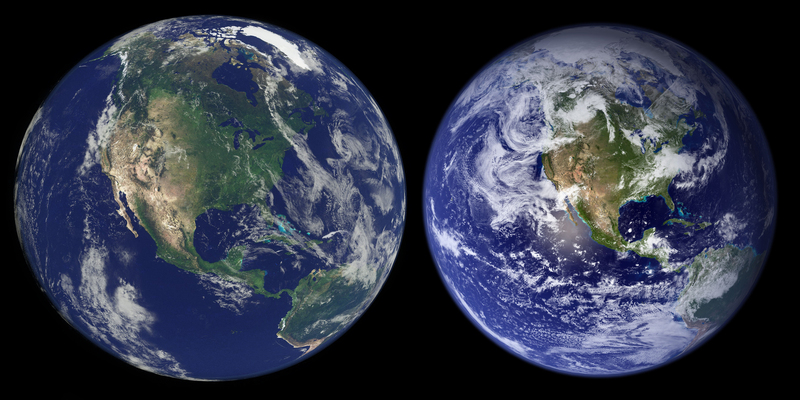 I use one GeoSphere for the planet, then two for the clouds (for the sake of movement) then a FogVolume as atmosphere. lavizh, Can I ask you a picture of your final result ? The second proble is the Fog Volume entity don't seem to be "obscured" in the darker side of the sphere. There is something i can do for resolve thode problems ? Have you adjusted the opacity for the cloud layers? I searched a lot but i can't find the parameter for opaacity, where I can find it ? in the material setting for the cloud shader ? I could be wrong though or misunderstand the issue alltogether. Aren't you using Spheres and attaching diffuse layers on it? Why would you need a Cloud Shader? I used the Illum shader on all 3 spheres. Just set the Opacity in the Material Editor for the Cloud material as seen in my rendering here (CRYENGINE render on the left, real earth on the right). This was an early shot so its missing the proper FogVolume atmosphere.